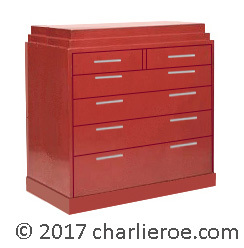 This is a new chest of drawers, inspired by an original Paul Frankl cabinet. The chest of drawers quite clearly follows his designs for the famous 'skyscraper' furniture he is best associated with. Both the plinth & top are stepped in true Skyscraper style. The original cabinet colour scheme was as the red robe above. As this is made to order, the sizes, proportions, no. or drawers, colour, etc. can all made made to your requirements. Also shown is a matching chest of drawers, to show how you can have a complete bedroom in this style. The robe could be made as a 2, 3 or 4 door version. The chest, below right, has the handles stepped as well, as Frankl liked asymetry in design. The bottom left picture shows the proportions changed to a taller Chest of drawers, emphasising the Skyscraper styling. The bottom right picture shows 2 things; 1. how you can change the colour of such a piece. 2. the plinth has an additional step, further emphasising the Skyscraper styling. This was omitted on the other chests shown above, because a higher plinth can cut down of drawer storage space. Made to order.